You will completely change the way you view the word IMPOSSIBLE. 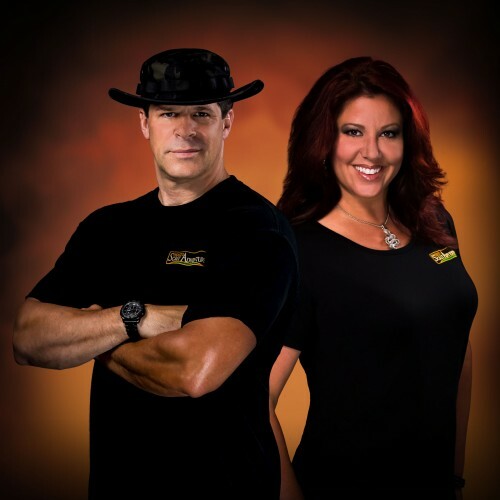 Each week Richard and Tanya Curren inspire millions worldwide through their award-winning TV series, SCALY ADVENTURES. Together, they created an international brand out of a dream to empower others to overcome their fears and live a life of passion and purpose by doing what they were created to do. They are masters at seeing opportunity where others see impossibility. In overcoming the same obstacles we all face; health, finances, discouragement and doubt, they have become an example to others of what driven people are capable of achieving. HOW ONE AVERAGE AMERICAN FAMILY CREATED AN INTERNATIONAL AWARD-WINNING BROADCAST TELEVISION SHOW WITH NO EXPERIENCE AND NO MONEY! In 2009 the Curren family found themselves at a crossroad in their lives. Richard Curren had just been downsized from a very lucrative medical device sales position. As the sole provider for his family, this was a terrifying place to find himself. But find himself is exactly what Richard did and along the way he discovered that your passions and your career need not be mutually exclusive. Together, the Curren family did the impossible. They created their own award-winning international broadcast television series, Scaly Adventures. With no guidance and very little funding, the Currens filmed a sample pilot on a consumer level camcorder which they then shopped to broadcasters looking for exciting new content. Within two weeks they were signed to agreements that would broadcast Scaly Adventures to six continents and make their son, Pierce, the youngest person in the world co-hosting an animal and adventure show with international distribution! Now, with over 50 episodes in rotation around the world, Scaly Adventures is an inspiring testimony of never giving up on being who you were created to be! Richard & Tanya Curren have inspired and motivated millions around the world through their work in television, print and other media! They are passionate experts in helping others to see that great purpose lies within them, equipping others to create a plan for success and then having the courage to follow their vision regardless of the fears that they will have to overcome. They are highly sought after speakers because they are real people doing amazing things while showing others that nothing is impossible for those determined to succeed! ON COURSE: STRATEGIES FOR SUCCESSFUL LIVING Wouldn’t you love to have one ready reference that helps you navigate through the challenges we all must face: adversity, forgiveness, change, dealing with difficult people, overcoming guilt, finding your purpose and so much more? This book is an excellent resource you and your family will use again and again. Over three years in creation, On Course: Strategies For Successful Living is broken down into sections and chapters that give you practical, Godly wisdom as you chart your course in life. To live a passionate life and raise successful children, you need to have clear, concise direction and a plan. This book gives you just that! By implementing these ideas and tools for living into your daily life, you will have a more focused and clear path for your successful outcome! 348 Pages Published 2012 © Boundless Limits International, Inc.
South Carolina House Resolution HR:4554 "A House Resolution To Recognize Richard, Tanya and Pierce Curren Of Pickens County For Their Dedication To The Wholesome Education Of South Carolina's Youth". US ARMY VETERAN - Captain Richard R. Curren III served for 16 years in both enlisted and officer capacities beginning as a Infantry Private and ending his career as a Captain in the Medical Service Corps. Meritorious Service Medal Awarded at end of career. Find out more about Rick & Tanya Curren at http://www.RickandTanya.com.